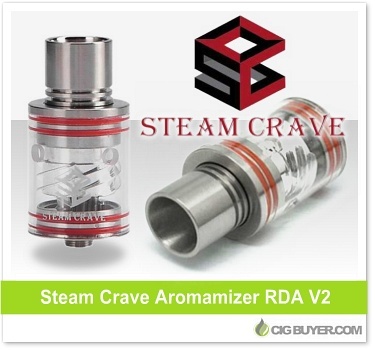 The Steam Crave Aromamizer RDA V2 is a revolutionary rebuildable atomizer that incorporates adjustable cyclone airflow to keep vapor temperature consistent and reduce flavor loss. Not only does it provide big airflow, vapor production and taste, it includes other great features such as spitback protection, deep juice well, large 3-post design (for single or dual coil builds) and peek insulator. It also includes a transparent glass cap that looks especially cool.